A two-sport standout at Miami Jackson High, Ernie Yaroshuk earned three letters and All-City honors in both basketball and baseball. He moved on to UM in 1959, where he played basketball for one year, before settling on baseball as his primary sport. At Miami, Yaroshuk served as the team captain his senior year, 1963, when he hit .448 ( still #2 all-time for seasons with less than 100 At Bats, #3 overall ) and set a then-record with 42 hits in a season. He was also named the team's MVP. 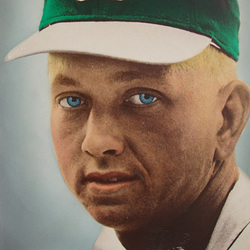 Ernie played both second base and right field for the Hurricanes. Following his career at UM, Ernie signed with the Philadelphia Phillies and played in their minor league system for a year and a half, at Miami and Bakersfield, Ca., both Class A affiliates. Yaroshuk returned to his hometown and spent many years as the general manager of Jerry's Caterers. His son, Ernie, Jr. played baseball at Stetson and his daughter, Paige Yaroshuk-Tews, played tennis at UCLA and is currently the University of MIami Women's Tennis Coach. When Paige was inducted in 2012, Ernie and Paige Yaroshuk became the first father-daughter duo to be enshrined into the UM Sports Hall of Fame.